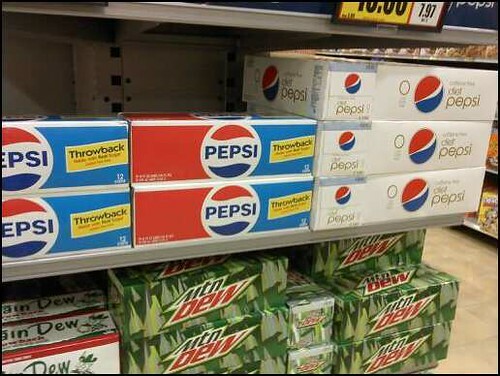 TYSONS CORNER, Va. — This morning while going through Harris Teeter, I was pleasantly surprised to see that Pepsi Throwback is available again. This time around, the red, white and blue packaging from the early 1980s is being used. I will be stocking up. While it doesn’t have quite the bite of regular Pepsi, any chance to consume less high fructose corn syrup is a good one — take that subsidized corn farmers! According the Pepsi Throwback Web site, the “real sugar” cola is available December 28, 2009 through February 22, 2010.